Caley Thistle goalkeeper Mark Ridgers. 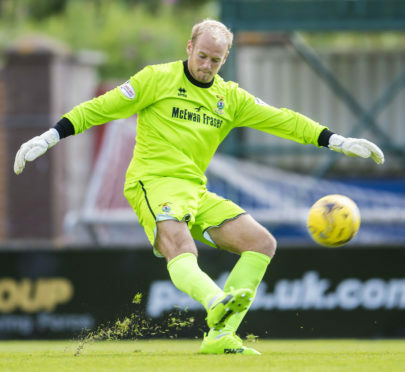 Caley Thistle goalkeeper Mark Ridgers is underwhelmed by his side’s Highland derby return of two points so far this season. Inverness have performed well in all three encounters between the sides, but fell to a 2-1 defeat on their last trip to Victoria Park in December following two draws earlier in the campaign. With the sides meeting once again in their Scottish Cup last-16 tie at Dingwall on Monday, Ridgers is intent on securing a first Caley Jags derby victory since March 2016. Ridgers said: “There is probably no better way to make progress than beating County, but it’s going to be a very difficult game with the way they are in the league. “They are doing well, and for all we have played well in the games against them we have not really got anything off it, apart from two draws which in my eyes is not good enough. “We need to go and try to get a win as I believe it has been a good few years since Caley Thistle have beaten Ross County. Ridgers began his career with County before joining Hearts as a teenager in 2007, however the 28-year-old has savoured his first taste of the Highland derby this term, and hopes to give the visiting Caley Jags supporters reason to celebrate on Monday. He added: “I love these games, being from Inverness and coming through the youth system at Ross County. “Before this season I had only played in them at youth level for County but the whole occasion is brilliant. You get a very good atmosphere – especially through there. “It has been well published that our fans support us really well away from home. “They support us well at home as well, and that’s something we have try and get right to give them stuff to cheer about at home. “I think our home form deflects from how well we have done away from home. It’s something I don’t think we’re getting credit for, a lot of people are just looking at the home form. Ridgers is full of admiration for Monday’s opponents, who are three points clear at the top of the Championship, and he added: “They have got that bit about them where they can get through games. You just have to look at the league, there have been a couple of games where they have not looked like getting anything but they have nicked a late winner.